In what could be best described by the idiom “you scratch my back and I’ll scratch yours,” Foxconn is preparing to spend $210 million on a new production line that will be used exclusively by Apple. The project is slated to get started in October in Huai’an City, part of the Jiangsu province in China, according to the China Daily. The publication says that the facility will cover about 40,000 square meters and will employ nearly 36,000 people in the region. The office of Taiwan Affairs of Huai’an City says that the plant is expected to have an annual output value between $949 million and $1.1 billion with an import and export value at $55.8 million. 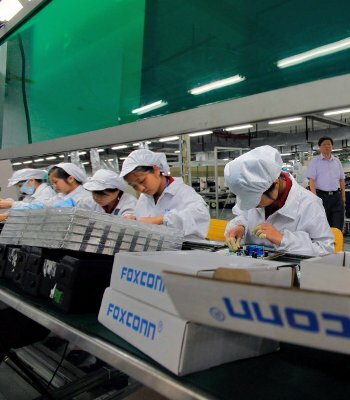 With only 36,000 employees, the new production line pales in comparison to some of Foxconn’s other installations. For example, the Foxconn Zhengzhou Technology Park that’s dedicated to making iPhones employs 120,000 people while the plant in Shenzhen is home to around 200,000 employees. Earlier this month it was reported that Apple would share the initial cost to help Foxconn improve working conditions at their factories in China. Details on that deal weren’t made public so we don’t know just how much Apple is pitching in to help their business partner. With construction not set to begin until October, the plant will miss the launch of Apple’s new Ivy Bridge MacBook Pro, iMac and iPhone this year. No word yet on what exactly Apple will use the production line to build.